Some of you have been talking about retiring and it got me thinking – maybe I should retire. 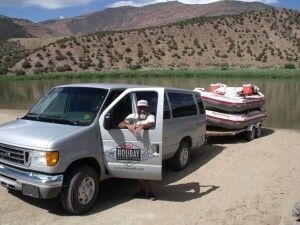 Today I began work at 7 a.m. driving eight customers, two river guides, boats and gear to Lodore Canyon for a 4-day river trip. After the first few miles of bantering and answering questions the people quieted down and I continued the 150-mile journey with my thoughts. As we closed in on the Gates of Lodore (named for William Southey’s poem on the 1869 John Wesley Powell exploration trip) the customers gasped. 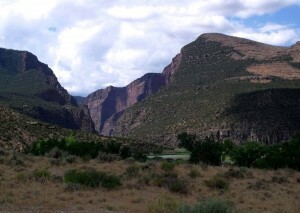 The dramatic view of two blood red, thousand foot vertical cliffs climbing from the river is an awesome sight. I never tire of seeing it. Picture two Yosemite El Capitans facing each other, with a river flowing between them. I’ve rafted through those cliffs more than fifty times and I know that another World, a different reality exists beyond them. A brilliant, and red-hot sun beat down on us, but by the river the cool microclimate was comfortable. I finished rigging the boats, helped the customers fit their pfds, said my goodbyes and climbed into the van. Through the clouds of my dust occasional glimpses of Lodore presented itself in the mirrors. 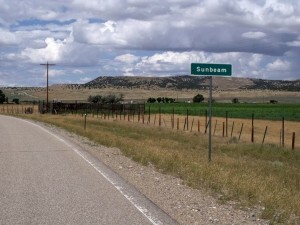 I eased onto the pavement of Colorado route 318 and headed toward Sunbeam. To my left wild horses roam. To the west are herds of trophy elk high above in the Zenobia Basin, shadowed by Zenobia Peak. Mountain lions, black bear, mule deer and desert bighorn sheep inhabit the basin in the summer months. They follow the snow line down as winter comes on. An impenetrable maze of two track roads, mostly leading to nowhere, weave in and out of the forest to Douglas Peak and its fire tower. From that tower you can see the curve of the Earth, to some empty and forbidding – to others an ecosystem teeming with life, historic sites, throwback ranches, and the Canyons of the Yampa and Green Rivers forming a “Y” as they meet in Echo Park. The idyllic Echo Park, site of the most significant conservation battle of the last century… and maybe of all times. People, investigated by the McCarthy Committee and shunned by their neighbors, lost their careers and families over the battle. The pavement, festooned by an unending line of yellow dashed lines blurred on into unconsciousness, and I was taken back to our farm in Slate Hill. As a child it too seemed to be an enormous land of forests with secret glades, fields of ripening hay, and landforms sculpted by glaciers. 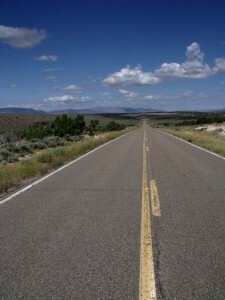 I could never live there again because… because… the dashed road swept on around bends, along the Little Snake River, over the Yampa River taking me through a kaleidoscope of scenery and colors. Sixty-four miles later I turned west on US forty and followed a roller coaster of dashed lines over hills and down valleys. Above a dark sapphire blue sky, the kind of blue you can only see in the West, hung small flat bottomed cumulus clouds, whitened as if they had been cleaned by Clorox, and aerated like balls of cotton candy. As the day wore on they would grow to massive thunder heads, 20,000 feet, 30,000 feet and higher. The small clusters of houses and trailers, barely specks on a map flew by: Elk Springs, Macedonia, Blue Mountain. Today there was no oilfield or tourist traffic, which would normally be sparse by any standard. In the distance a speck came closer, a semi-truck, and we waved as we flashed by each other. Things tend to move slowly in the desert, but here a pronghorn crossed in front of me loped for a distance alongside and stopped. Along the road the last vestiges of summers green: wheatgrass and rabbitbrush gave way to an ocean of dull olive colored sage. The smell of sage still hung in the air from yesterday’s rain, an ocean of sage, waving gently in the puffs of wind that reminded me of a child blowing out birthday candles – only on a larger scale. To the south a line of trapezoidal-like towers stretched beyond the horizon, a sort of conga line of steel three dimensional Fremont-like anthropomorphic petroglyphs. Each broad shouldered figure drooping its arms to hold the wires that go from Earth to oblivion. To the north the massive escarpment of Blue Mountain curved and rose, shoved skyward by the force of Earth and exposing an array of colored formations: beige, blue-gray, tawny, tan, chocolate, grey and red, each created by their own specific forces and environments. 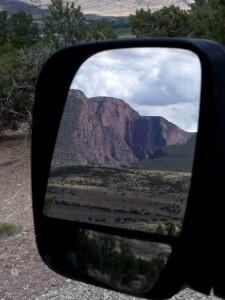 And then Skull Creek, Artesia – or Dinosaur as it is now called – whisked by. 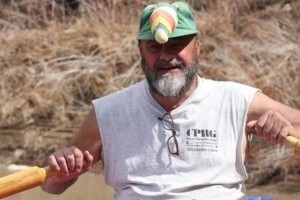 Soon I was at the Holiday River Expeditions boat camp in Vernal and headed back home in Jensen. I will repeat the fantasy nearly every day for the next week. 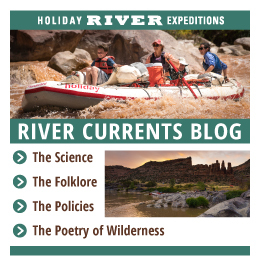 On the 10th of August I head for an escape, my own reward: a four-day trip down the Colorado River through Ruby, Horsethief and Westwater Canyons. Yes. Perhaps I should retire. But I have not yet answered the question: How can retirement be any better, despite my chronic aches and pains, than this?